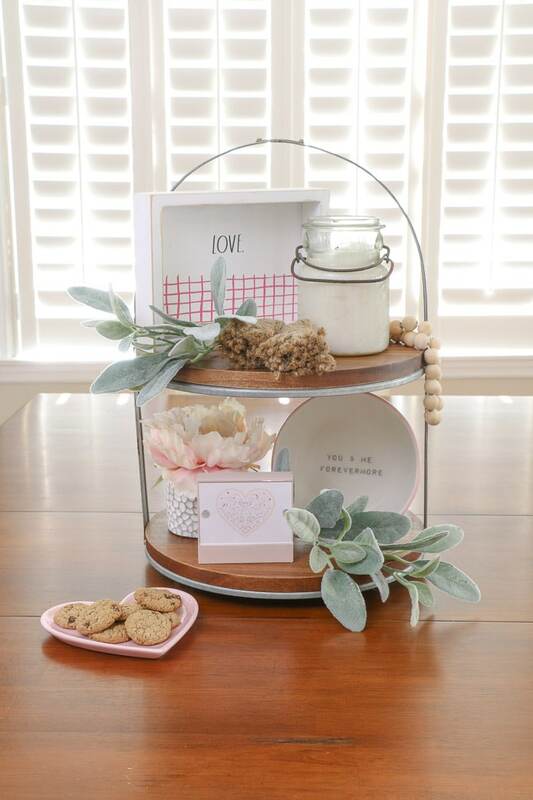 This Valentine day table decoration is easy to create using a tiered tray and heartwarming accessories. 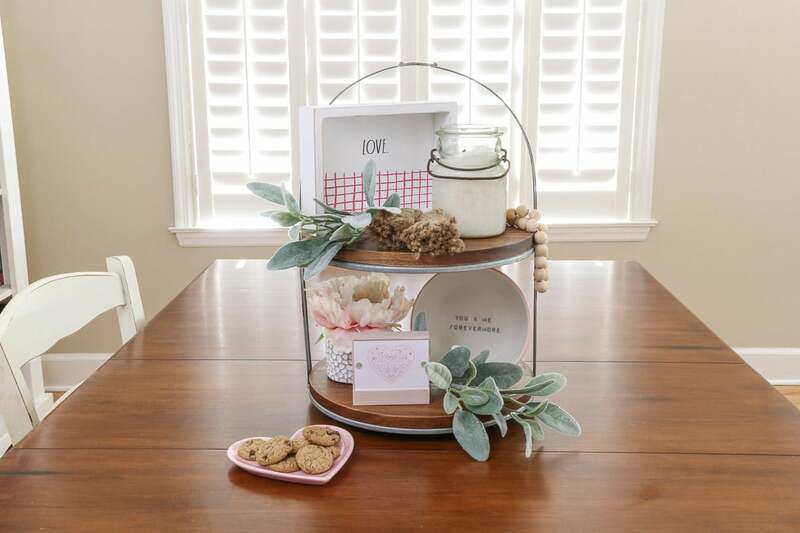 Follow along with step by step instructions on how to create a tiered tray for Valentine’s day. Creative Valentine’s day ideas are all over the internet. 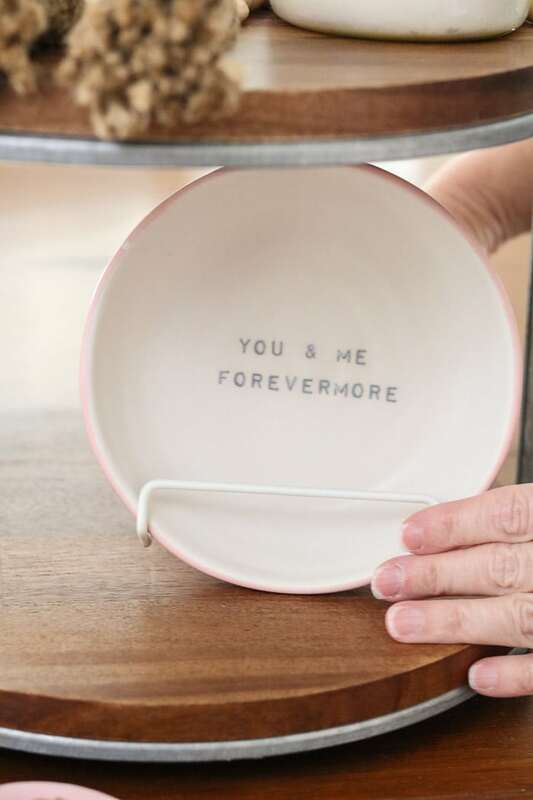 We even have a few other ideas like Valentine tablescapes, Valentine garland ideas, and chalkboard ideas to name a few. But being able to create your romantic piece is another story. So let’s jump right into creating a Valentine day table decoration with a list of what you will need to create your design. When you shop for accessories purchase more than you will need. I find that sometimes one item works better than another and it is always more fun to have extra stuff to play with when creating. Let’s begin with selecting a tiered tray. 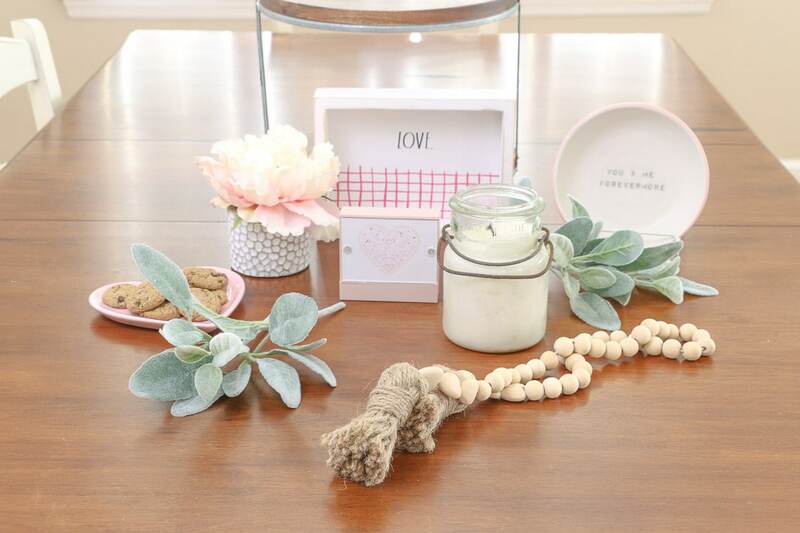 There are so many fun option on the market until we decided to write a post of favorite farmhouse tiered trays. 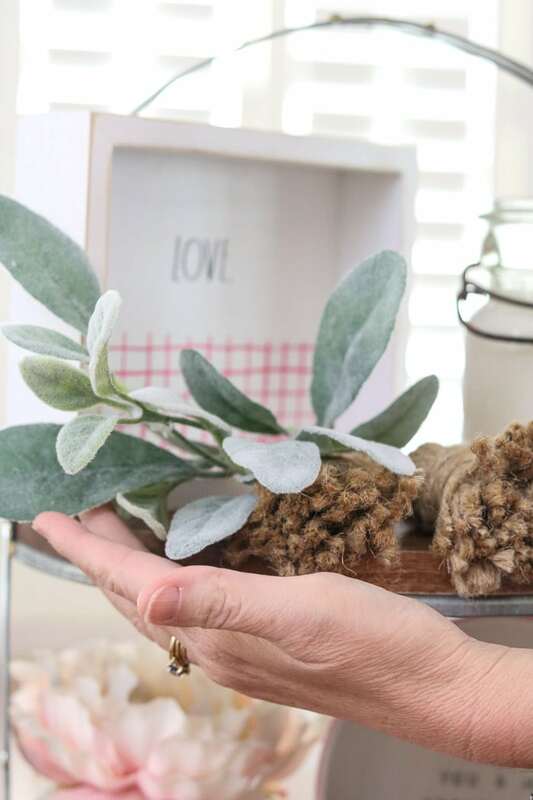 But if you are handy and like making things then try our How to make a Tiered Tray DIY or here are some more options from galvanized to wood. On this, Valentine table decoration, start with the larger items. I like to start with the top tray, so I pulled this Rae Dunn Love sign and sat it off to the side. It is always nice to include something, Rae Dunn. 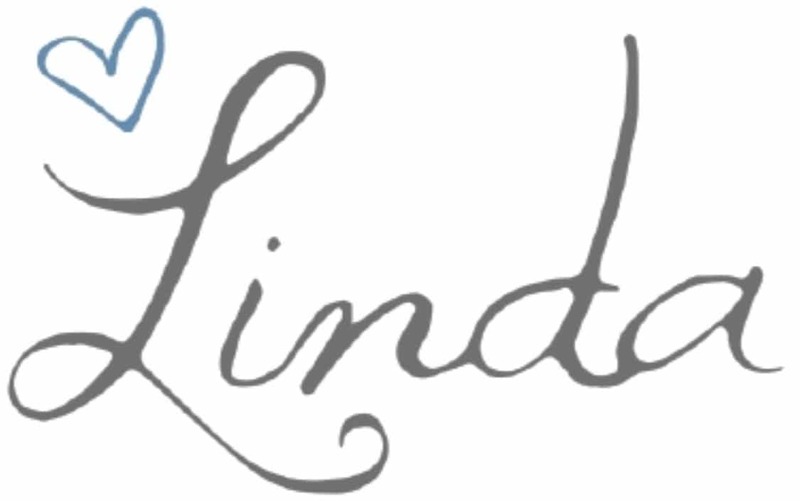 We have found so many people like Rae Dunn until we did a whole post on Rae Dunn tiered trays. 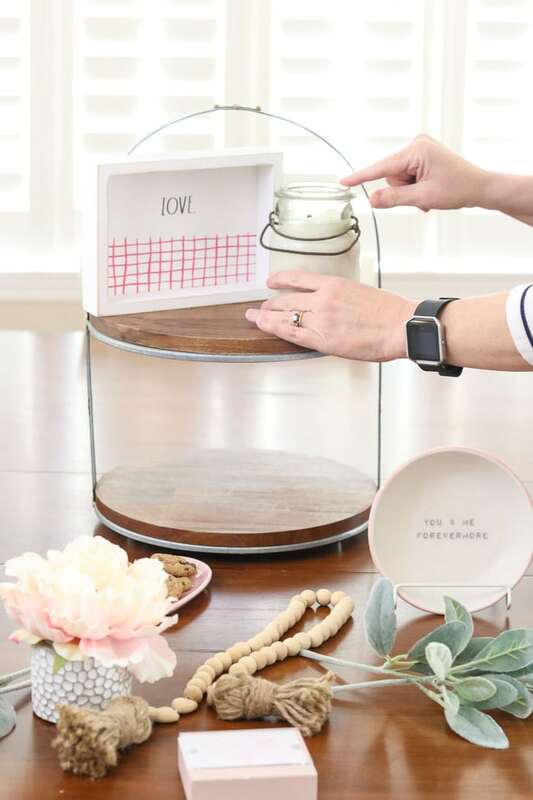 I was then pulling something of similar height but a little shorter I used this old mason jar candle to balance the top tray. Next, I grabbed the wooden bead garland to add a third layer to the top tier. Garlands can be sometimes tricky and seem awkward to place between accessories. Gently lay it around the other pieces and back away from the tray to see how it flows with the rest of the accessories. The beautiful thing about accessorizing is that you can go with the flow and keep trying arrangements until you find just the right ensemble. Now it is time to work on the bottom stand or tier. Again pull the more significant items first and place them on the stand. I began with the plate and sat it off to the opposite corner if there is such a thing as a corner when you are working with something round. Follow with adding another larger item next to the first larger item. Okay now, this Valentine’s day tiered tray is starting to come together. 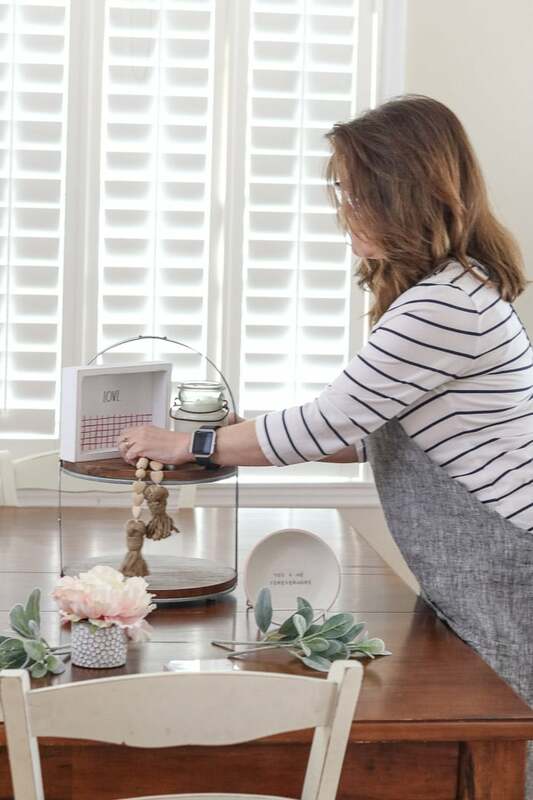 Next place a smaller accessory front and center on your bottom shelf of your tray. 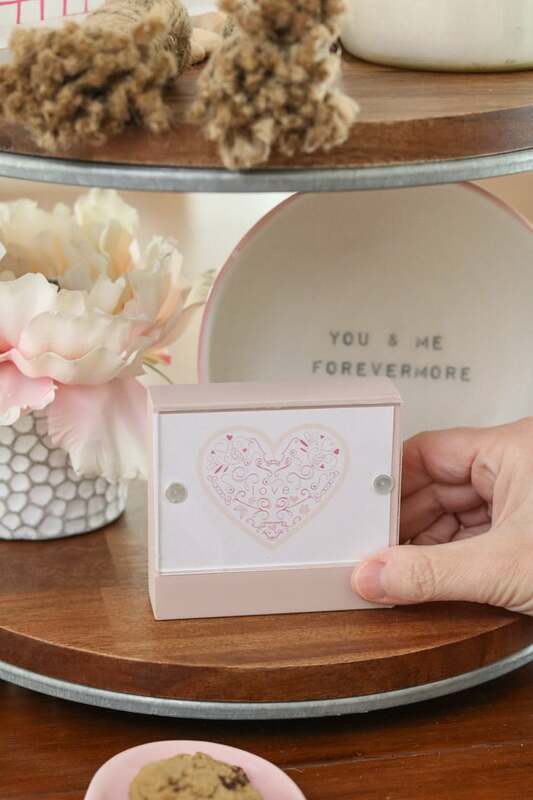 This cute pink acrylic frame was the perfect spot for a Valentine free printable. 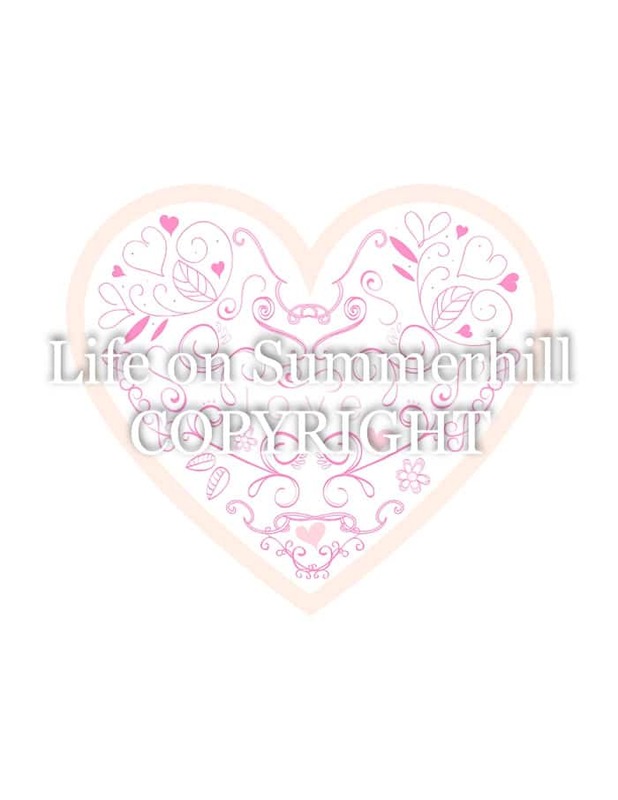 This printable is of a blush colored heart with swirls, flowers and hearts inside but that is not all. Look carefully and you will find the word “love” written inside the graphics inside the heart. Remember to get the free printable simply subscribe and you will have access to my library of printable including this heart. If you get a small picture frame like this and want to print the Valentine heart simply use the index card setting when you go to print. The heart comes out the perfect size for this precious mini frame. Now for the last step, the finishing touch, the icing on the cake. Toss in some filler pieces like these lambs ear sprigs. The soft finish on the leaves was just what this tiered tray needed to pull the whole design together. Plus the green tone helped to unify the space. It was just what the love doctor ordered. LOL! 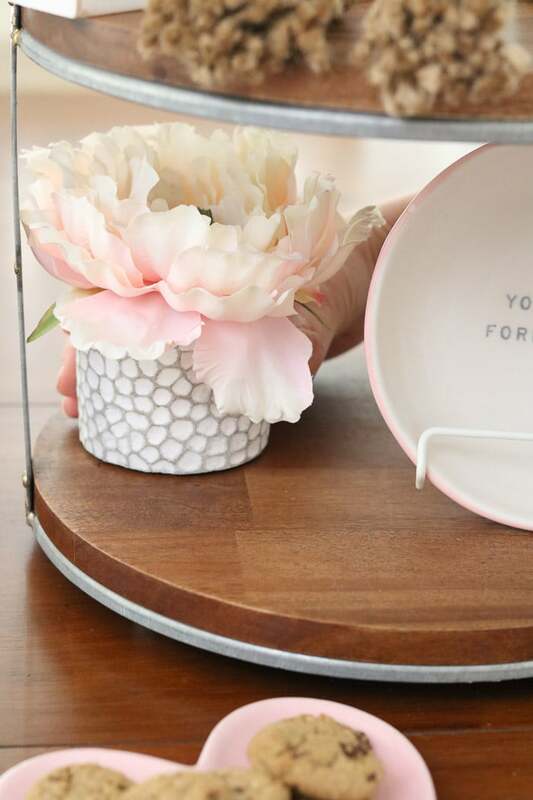 Finally, let me encourage you to have fun and if you are making this tray for a special someone grab some accessories that are meaningful to that person. I added a small plate of cookies in front of the tiered tray. I like to add a little something that anyone can touch or eat like cookies or these scones by Seven Sister below. It makes the centerpiece even more special. 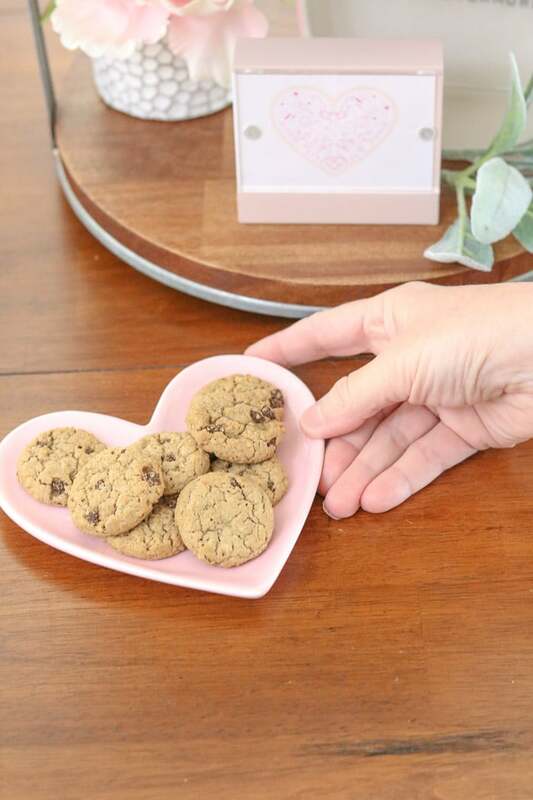 $5 off shipping with code SHIPME.That way the Valentine table decoration is not just for looks but functional too. 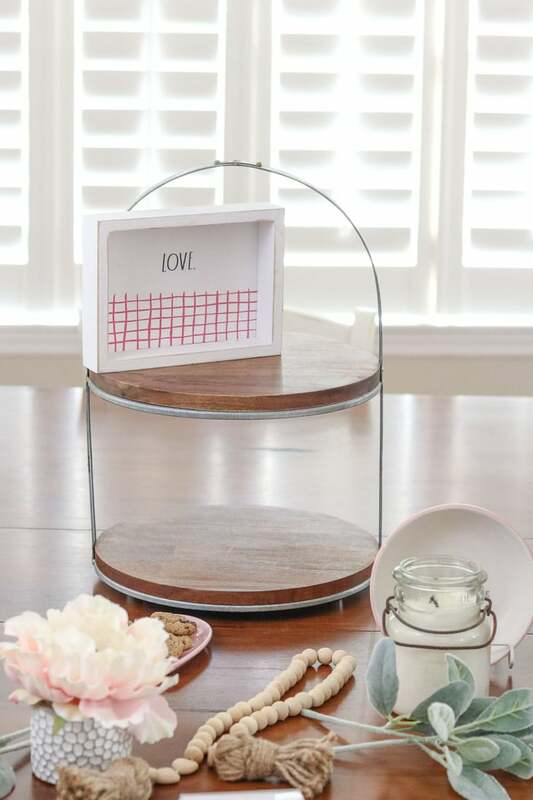 I hope you have found this Valentine tiered tray idea helpful and I hope those special people in your life love every minute of it. Love this! I did a tiered tray for Chuck last year and he absolutely loved it. I have all kinds of items to use and the perfect 3-tier tray. I become easily intimidated wanting it perfect. You inspire and energize me! I’m going after it. Yours is simple, festive and not overdone! Luv it! !